We offer an integrated systematic approach to help your business succeed, based on proven commercial principles and frameworks, as well as our own experience. We work with our clients across some or all of the areas outlined below. Our involvement can be as simple as an occasional meeting to provide guidance and mentoring in a single area, right through to hands on, co-development across the entire process. Vision and mission setting – what business do you want, what position do you want to be in in the future, what does success look like and what do you need to do to achieve it. Competitive threat assessment – Understand who holds the balance of power in your industry. What are the opportunities and threats? Environmental scanning – what are the big things coming in your operating environment that may impact your business, or provide the next big opportunity? Strategy review – how are you going against your current strategy? Is your current strategy still relevant? Does it need to be reviewed? 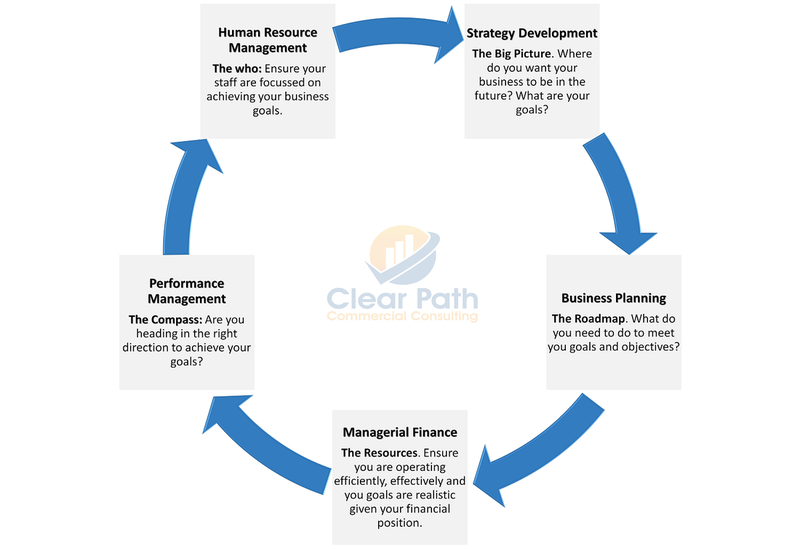 provide clarity across your business on the key activates and programs of work required to deliver on both your strategic and operational goals. draw linkages between your staff’s day- to- day roles and the broader company strategy. This helps make the strategy real for all employees and is key to building engagement and staff buy-in. communicate business goals and objectives across your business. align your strategy to your financial position – future goals and targets are important, but they also need to be realistic. We can provide insight to ensure that your goals are achievable given the financial position of your business. Many companies have failed trying to reach ambitious goals that were beyond their financial means. conduct financial health checks – often people only rely on sales and profitability as a guide to financial health. While these are important, they do not tell the whole story. Financial health checks can help to assess your company's effectiveness, efficiency, unlock hidden potential and ensure long term viability. advise on business case development – we can either help you to develop your business cases, or provide an independent review to ensure your business cases hits the mark every time. advise on cash flow optimisation – we can review your internal processes and provide guidance to help optimise your business cash flow. advise on supply chain and inventory optimisation – Review your supply chains and inventory process to help ensure you strike the right balance between meeting your customer needs and reducing your financial costs. advise on mergers and acquisitions – conduct initial feasibility assessments including both financial and non-financial analysis. As the timeless saying goes, what gets measured gets done. There is no point having goals and objectives if you never track your progress. We work with clients to identify key measures of success that track performance across all levels of their organisation, ensuring that their business is focusing on what matters, and not on distractions that do not add value. work with clients to identify the key measures of their business success, associated targets and provide insight into what actions will positively influence these measures. design scorecards and reports that enable decision making and intervention by management teams, based on actual business performance. For the majority of our clients we do not believe in using expensive software packages for this, but rather we develop solutions based on the resources our clients currently use. Structure – Identifying the optimal team size and design to meet your goals. Staff alignment and accountability – Helping you to develop staff contribution plans that align your employee’s individual goals with business objectives, as well as hold staff accountable for their performance. Performance review – design effective staff performance review processes that provide meaningful feedback and drive both staff and business development. Workplace culture – Work with you to strengthen employee engagement and develop positive workplace culture. Foundations in commercial acumen: traditionally we take people from a non-financial background and give them a basic understanding in financial principles. This is very popular with sales reps etc. who are looking to understand the business consequences of their day to day decisions. Foundations in performance management: This is a popular course for team managers or people who are looking to improve their staff management skills. It brings together key elements from human resource management, with the basics in performance management to help team managers get the most out of their staff. ​Please contact us to discuss your requirements regarding facilitation, training courses, or any other additional services.